Making cookies is a lovely tradition and I do it every year with my friends. Exchanging family cookie recipes along with some great pictures is exciting and this is what this SHF/IMBB is about. It is hosted by none other than the Domestic goddess, Jennifer and Alberto of Il Forno. From these creators of SHF and IMBB, this is a super-duper bloggers event. My family does not share the cookie-making tradition since most families in India do not own an oven. I grew up on bakery cookies and packaged biscuits, most of them are eggless, catering to the predominantly vegetarian population. For this SHF, I recreated some of my childhood favorites. 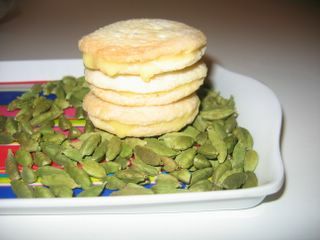 Cardamom cream sandwich cookies- I love True Elaichi biscuits. This homemade version is based on Gale Gand's recipe. It has ground cardamom and some crushed saffron in the dough. 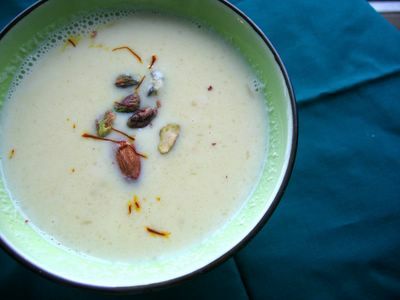 The cream filling made with butter, powdered sugar and milk has ground cardamom and I also added a drop or two of cardamom extract from India. Truly exotic and I will have to make more for swapping. 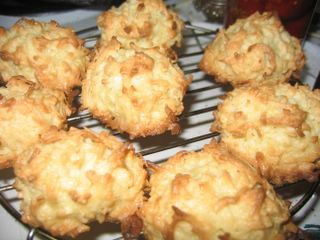 Coconut macaroons- A common macaroon recipe that I baked to a perfect golden brown as those I get from Indian bakeries (not just pale on the edges). It is crispy on the outside and chewy inside. 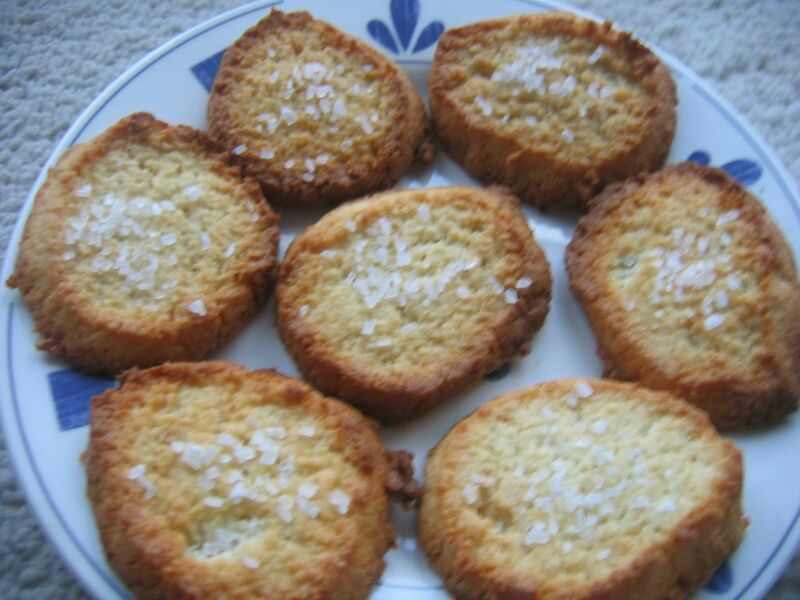 Faux Nice biscuits- Nice biscuits are perfect for eating on their own or dunking in coffee. They have a lot of coconut and a crisp sugar sprinkle on top. This recipe tastes exactly the same though in a different shape. Sieve/sift flour and baking powder. Cream butter and sugar. Add flour and desiccated coconut, extracts and make a soft dough with milk/water. Roll into a cylinder and further roll the dough into a square butter paper. Chill it for 4-5 hours or till hard (Do not freeze). Bake at 350 F for 15 mins or till dark golden. ooh I loved Nice biscuits as a kid! I can't wait to try this recipe...thanks for sharing. Wow.. 3 types of cookies, impressive, Mika. So many recipes to try, first I am going to start with coconut macaroons. Ooo! They all sound so good, Mika. I think those cardamom sandwiches are calling to me! came in via Nupur's.. I have never tried baking cookies.. I will have to buy an oven it seems. Wow we liked all these Mika! We have rarely made cookies at my dhaba. These are already into our must-do's. Will post the results soon. Cheers! I love the idea of those elaichi sandwich cookies- look and sound amazing! Where in California are you moving to?? Hi Nupur and Shammi- loved nice biscuits for dunking. Indira and Nic- thanks for the compliments! Welcome Anthony and VKN- cookie making is very satisfying. They also last longer than cakes or pies. So I make them especially in this season. Hi Tanvi- elaichi sandwich cookies are delicious. I also like pineapple sandwich cookies. Next time I will try that. bTW, we are moving to Sunnyvale. Your Cardamom Sandwich Cookies may well be the cookie of my dreams - can't wait to try! I've been searching for a recipe for nice biscuits- thank-you. can't wait to try them. what do you mean by powder sugar- is that like caster sugar? Can we use other flours like ragi, jawar or bajra instead of plain flour in faux nice biscuits? Donna, powdered sugar is icing sugar, not caster sugar.